Sign up for Broadjam today to follow RAY COLLINS, and be notified when they upload new stuff or update their news! 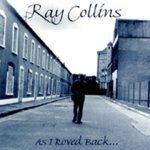 a mix of acoustic ballads and electric guitar-driven raucousness from the bard of belfast. ?AS I ROVED BACK TO YORK STREET? Words an Music by Ray Collins. will we ever meet again?? anything goes if you just care to try it on?oh lovely..